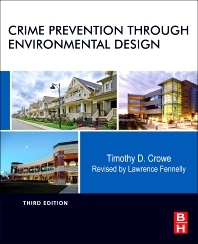 Crime Prevention Through Environmental Design, 3e is a vital book for anyone involved in architectural design, space management, and urban planning. The concepts presented in this book explain the link between design and human behavior. Understanding this link can enable a planner to use natural environmental factors to minimize loss and crime and to maximize productivity. This practical guide addresses several environmental settings, including major event facilities, small retail establishments, downtown streets, residential areas, and playgrounds. A one-stop resource with explanations of criminal behavior and the historical aspects of design, it teaches both the novice and the expert in crime prevention how to use the environment to affect human behavior in a positive manner. Timothy Crowe is a criminologist specializing in consulting and training services in law enforcement, crime prevention, juvenile delinquency and control, and major event law enforcement services planning. He has served in state government and with several consulting firms and has provided security services for Republican and Democratic national conventions.He has served as the Director of the National Crime Prevention Institute at the University of Louisville and created NCPI's CPTED training program. Mr. Crowe received his M.S. in criminology from Florida State University.